Copyright: © 2016 MCLE, Inc.
Print Book 1378 pages in 2 volumes (printed book) with downloadable forms Note: For print books, with MCLE's supplementation service, new supplements and revisions are mailed automatically with an invoice. If you do not want to subscribe, please check the opt out option during checkout. 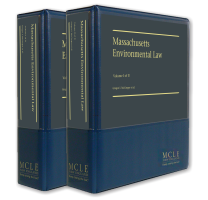 Massachusetts Environmental Law is a comprehensive guide to state and federal environmental laws and regulations. Experienced practitioners address dozens of environmental issues, providing clear explanations of controlling law along with valuable practice insights. A list of common acronyms helps sort out the alphabet soup of environmental terminology, and more than sixty helpful exhibits, including checklists, sample pleadings, forms, and departmental guidelines, are available for download. Whether you're a public-sector lawyer or counsel for an individual, business, or nonprofit organization, this essential resource will be your valued partner in taking on today's environmental challenges. updated information on environmental grant and loan programs in Massachusetts. We trust you will find the 2016 edition of Massachusetts Environmental Law a valuable resource, as we at MCLE continue our efforts to bring you the latest solutions to the issues you face in your practice. Michael E. Billa, Tetra Tech, Inc.
Sean Reardon, Tetra Tech, Inc.
Ingeborg E. Hegemann, BSC Group, Inc.